LISTEN to a Sample SONG! LISTEN to a Sample POEM! 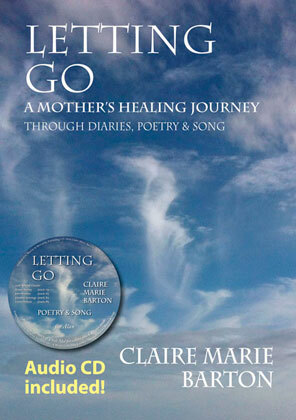 Claire Marie Barton's first book of poetry and song is an extraordinary healing journey of a mother whose tragic loss of her first born son set her on a path of an amazing series of events that actually makes you believe that there are angels guiding us and helping us through difficult times. What makes Claire's journey stand out is although her son died shortly after birth, it has had such a profound and lasting effect on her life. Her poems, songs, and journals included in this book are so beautifully and honestly written that you are drawn into the very experience of her loss, grief, and ultimate healing. On so many occasions the timing of people, places, and events provided the life-changing lessons, and gave her the inner strength to continue on what can only be described as beautiful, miraculous, and full of magic. When Alan died everything changed for me. What was supposed to be the worst thing that ever happened to me, turned out to be the greatest blessing. I have learnt so much from Alan- joy, pain, heart-breaking sorrow, grace, acceptance, love, compassion, empathy. But most importantly he showed me how short and precious this lifetime is and not to waste it wondering what could have been. After working as an ecologist for over 20 years, I have been moving towards doing something new in my life- working as a holistic therapist and singer-songwriter and poet. I am currently in practice in Clonakilty offering sound healing treatments and angel card readings. I am blessed to live in West Cork looking out at the sea, with my husband Col and our sons Cillian age ten, and Jamie age seven. "At every twist and turn of our lives, we are faced with uncertainty", Claire Marie Barton tells us in one of her songs, and we believe her. In "Letting Go" Claire Marie takes us with her on her intimate journey from her son Alan’s conception, through the joys and apprehensions of pregnancy, to her heartbreak at losing him shortly after his premature birth. We understand when she shows us how Alan remains an integral part of her family; Claire Marie continues to relate to him spiritually. Through reflection and through her healing and creative practice, she has travelled beyond grief, and takes us with her by sharing her diaries, and the bitter sweetness and soaring beauty of her poetry and song. — Breda Wall Ryan - Author of "In a Hare’s Eye"
"Clare has taken a path less-travelled in her brave account of the birth and early death of her first-born son, Alan. Her story tells of a unique approach to the loss of an infant and offers an unorthodox insight into opportunities that may lie beyond the conventional. Honest and inspiring." "After reading Claire Marie Barton's book and feeling the emotions that she expressed touched my heart and brought tears to my eyes. And then listening to her poetry and hearing her voice on the CD was like listening to an angel sing." "Claire's story is so personal and will undoubtedly touch many who have experienced grieving for a loved one. I especially loved the CD! I have to tell you that the audio quality was incredible. It felt and sounded like Clair was in my living room reading her poems and singing her songs. She has a beautiful speaking and singing voice." "Letting Go" is a rewarding journey full of angels, beauty and the magic of love. 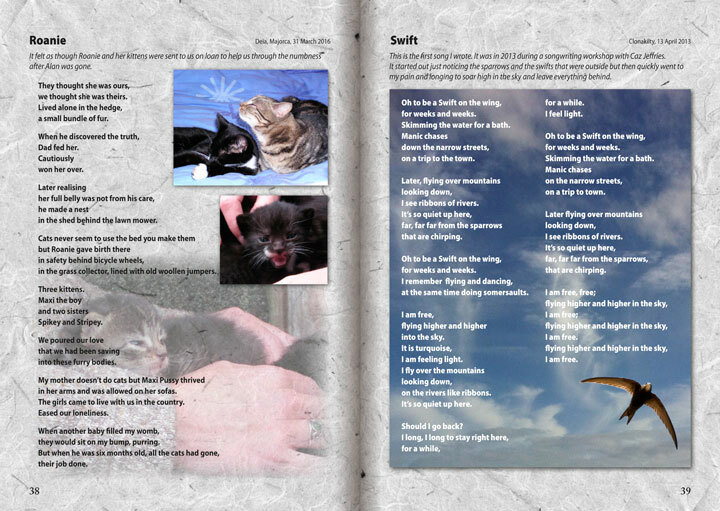 It is a source of inspiration for any reader who has lost a loved one. 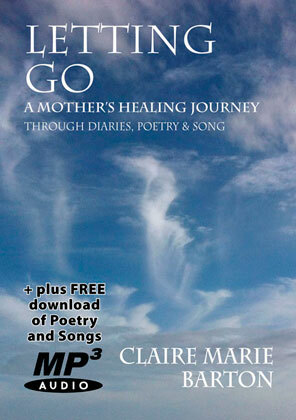 The accompaniment of her recorded songs and poems is a further extension of her healing journey. Highly recommended. 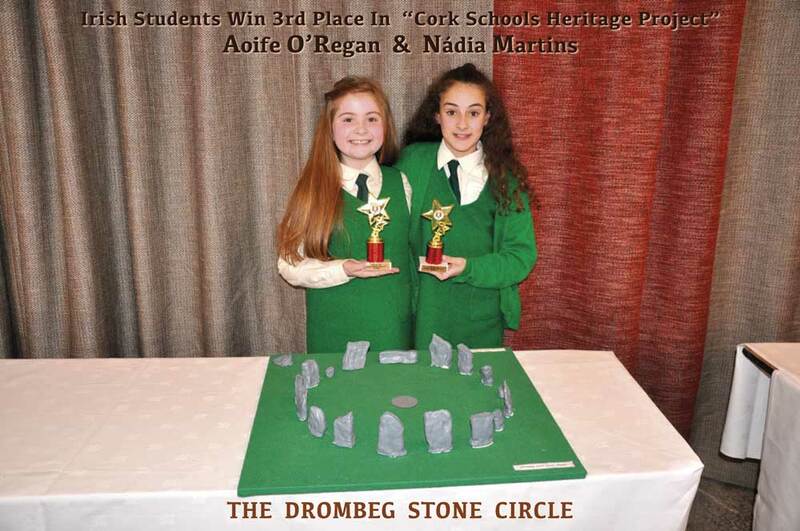 — Ronan Murray - Author of "Secrets of Drombeg"